In 2008 Ferrari celebrated their 16th victory in the Formula 1 Constructors’ World Championship. 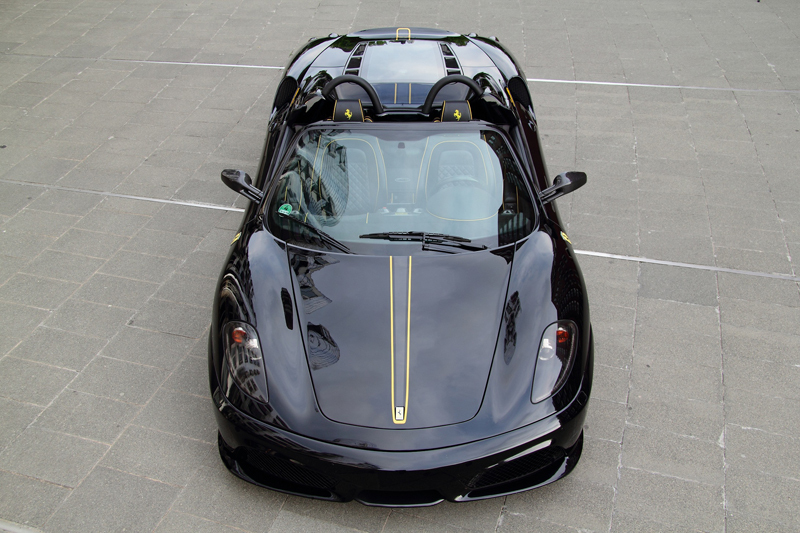 To commemorate the accomplishment, Ferrari introduced the F430 Scuderia Spider 16M – a lighter and faster limited-edition model. 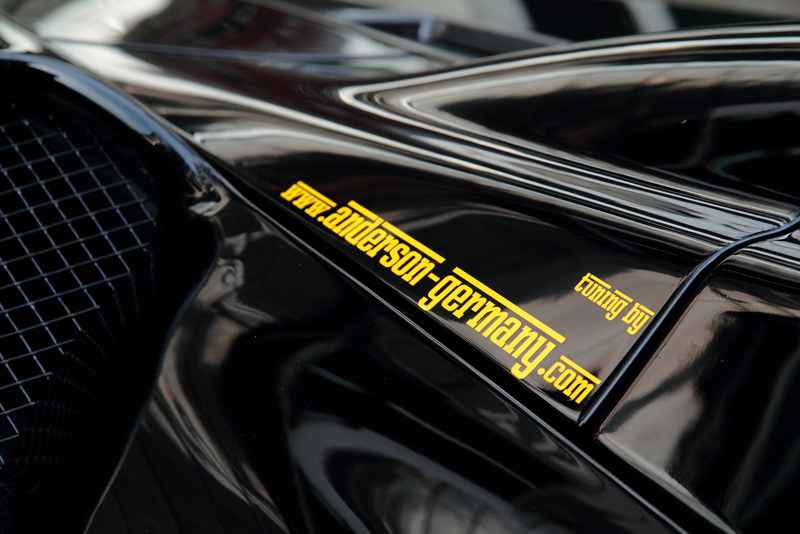 If that’s not exclusive enough for you, Anderson Germany has developed a new conversion package with stunning Hyper Black paint, even more power, and lightweight carbon fiber. 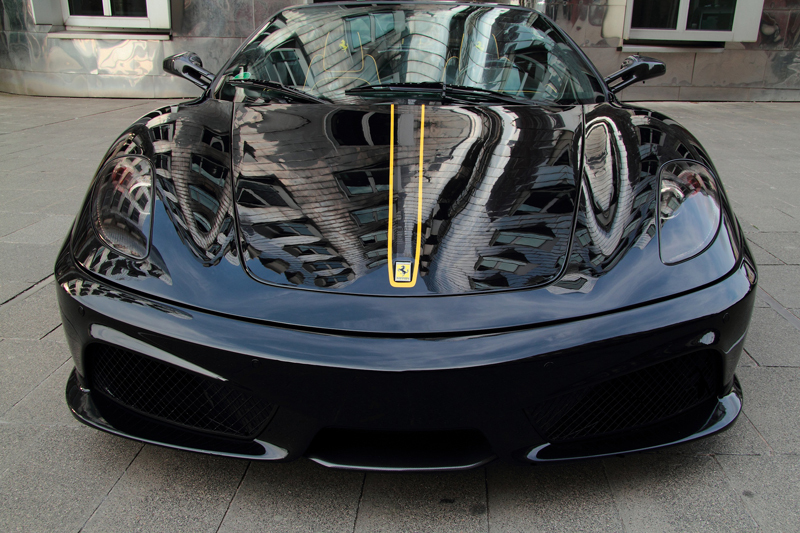 Even though only 499 examples of the Ferrari F430 Scuderia Spider 16M were made, Anderson Germany still developed an aerodynamic package to give customers even more options with their limited-edition model. 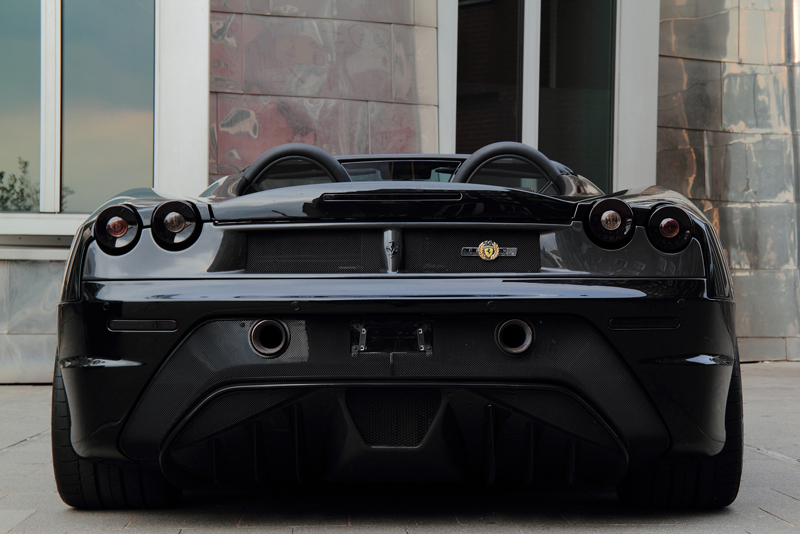 Making the Spider stand out even more is a coat of Hyper Black paint that covers the entire exterior of the car. 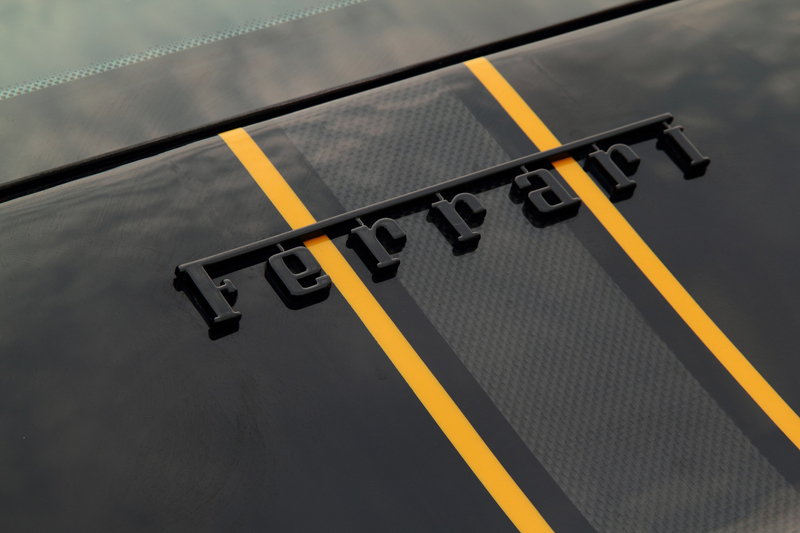 The unique Scuderia stripes are now carbon steel with a yellow border. To go along with the sinister paint, the headlights, taillights, and windows have been tinted. 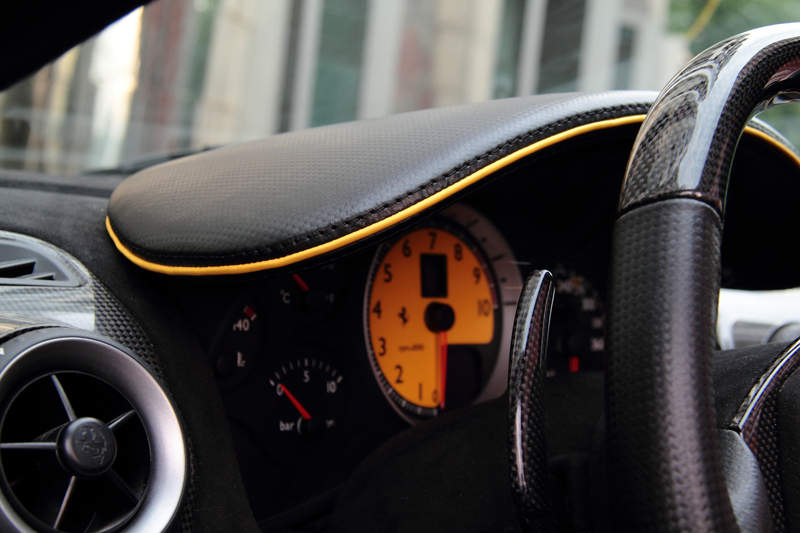 A carbon fiber package that consists of side mirror covers, rear diffuser, engine grille, and engine trim highlight the overall theme of dark speed. Downforce is improved with new side skirts, front air dam, and rear apron with integrated exhausts. 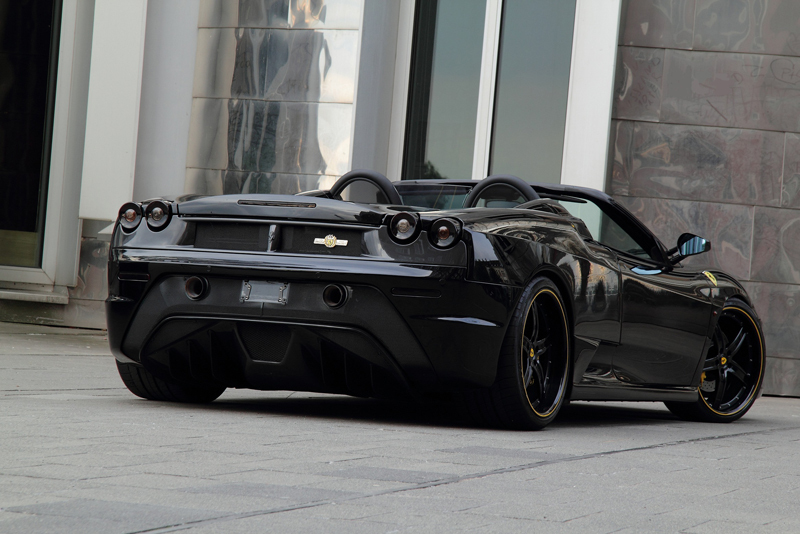 The carbon fiber and black color scheme is carried over with the new wheel and tire fitment. 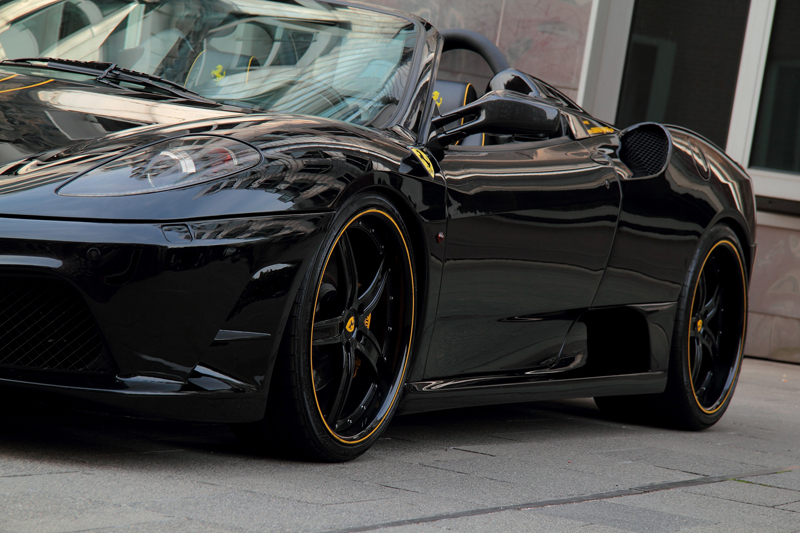 Anderson Germany has equipped the Scuderia Spider 16M with new three-piece five spoke wheels. 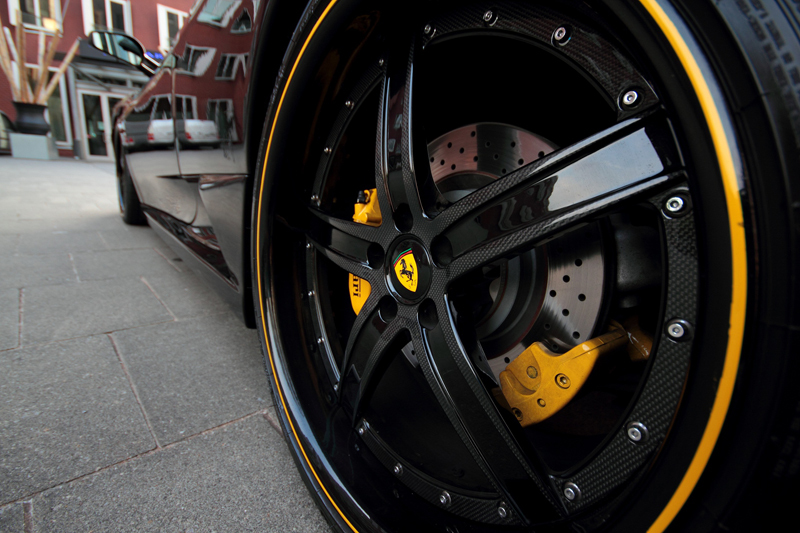 The 20-inch wheels feature a gloss black finish with carbon fiber accents and visible screws. All four of the brake calipers have been painted yellow to match the subtle yellow striping on the exterior. For better handling, Anderson Germany has installed a new sports suspension. If the Hyper Black exterior paint isn’t threatening enough for you, Anderson Germany has managed to crank out a few Italian stallions from the 4.3-liter V-8 engine. A new exhaust system with racing catalytic converters, modified headers, and a three-way adjustable damping system has been installed and produce a violent exhaust note. Not only does the exhaust provide more sound and power, but it also helps save 64 lbs. 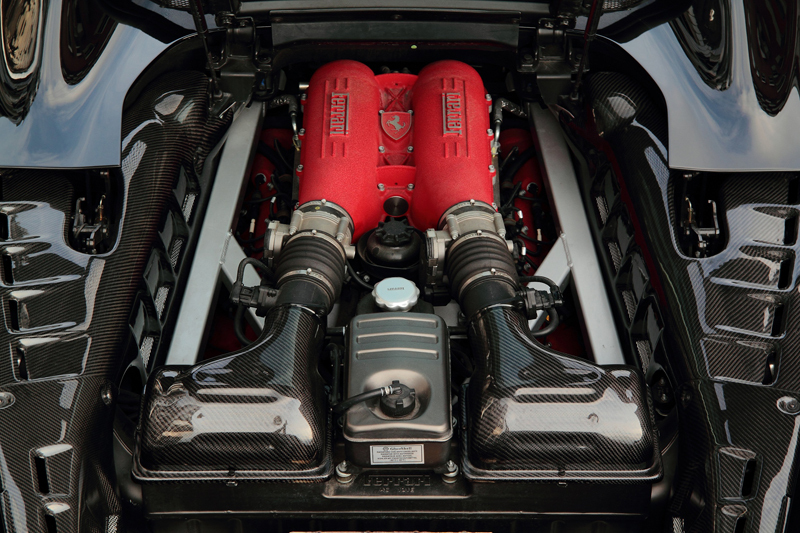 After an ECU tune, the engine produces a total of 569 horsepower. 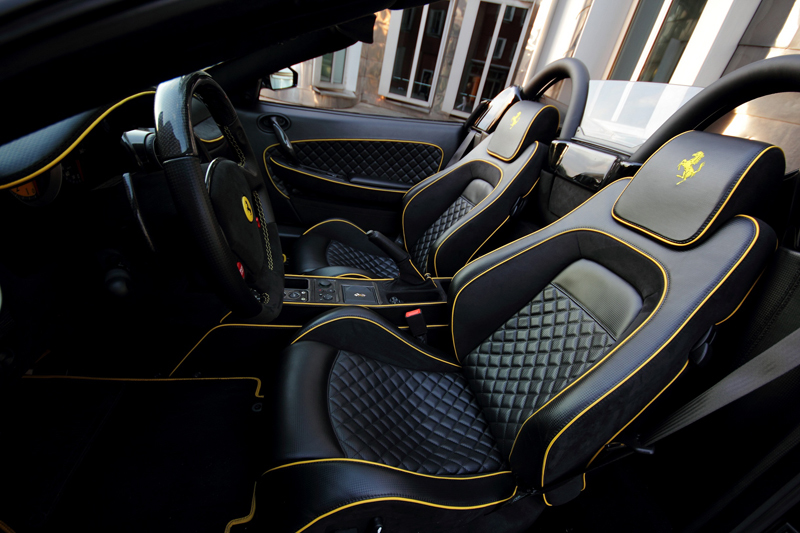 The darkened soul of the Ferrari F430 Scuderia Spider 16M is ever apparent in the interior. 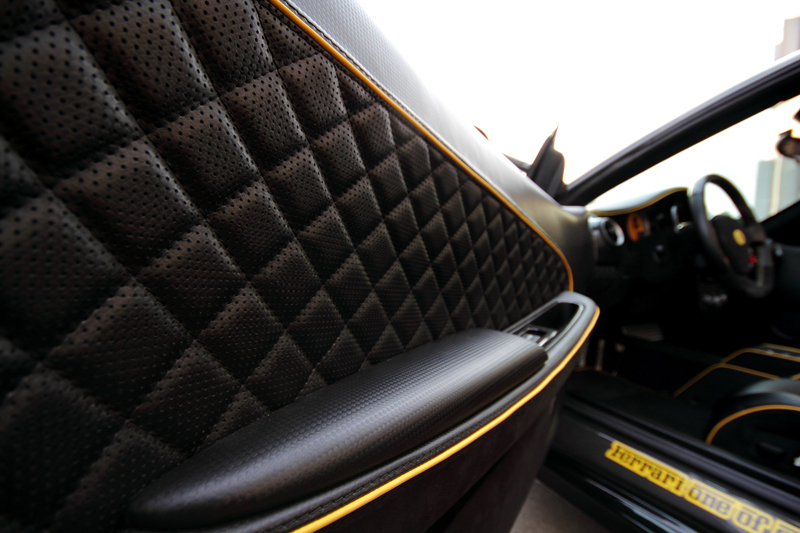 Carbon black leather and Alcantara with contrasting yellow diamond Kederrand seams adorn much of the cabin. The steering wheel, door handles, paddle shifters, door sill plates, and handbrake lever have all been replaced with carbon fiber components. 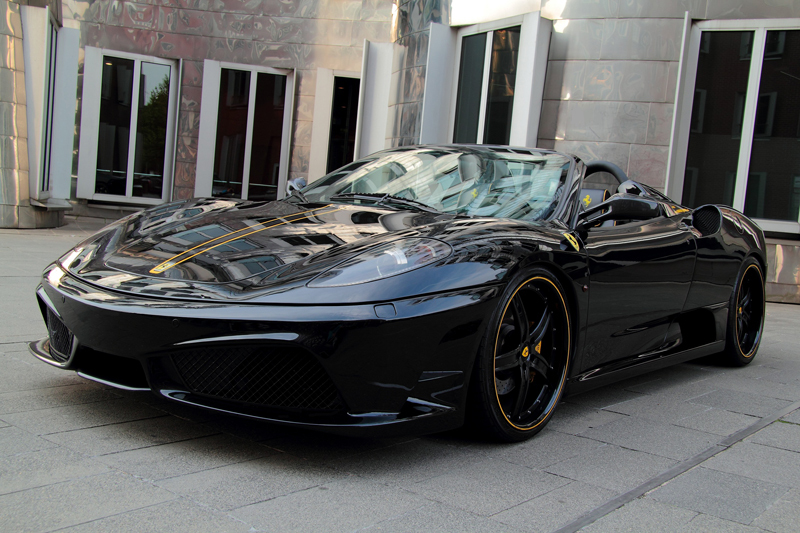 The complete Anderson Germany Ferrari F430 Scuderia Spider 16M is currently available from the German tuner. Pricing has not been released. 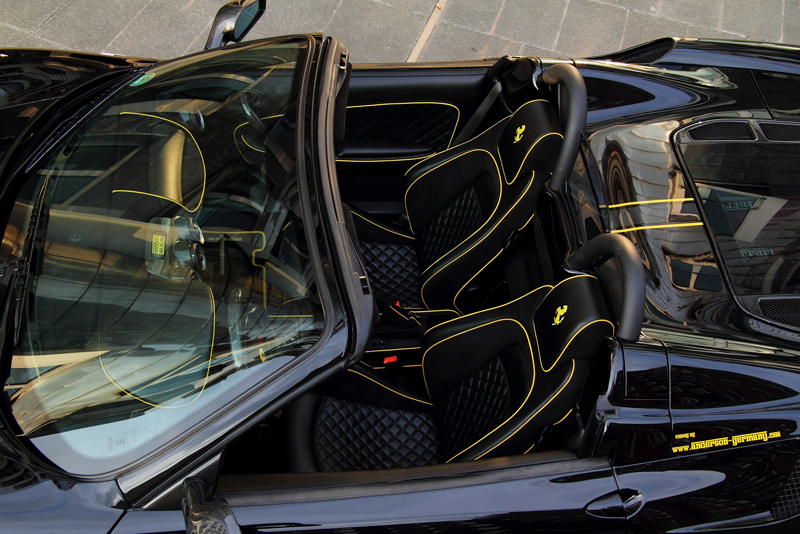 Do you like the Hyper Black and yellow color scheme on the F430 Scuderia Spider 16M? Leave a comment and let us know!